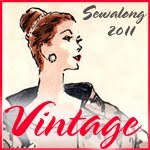 I’m joining this vintage sewalong this year. It’s an informal sewalong which is what I like. You have to choose a vintage pattern (published prior to 1995) and your fabric choice in January and post the finished product in February. Easy enough. I have plenty of patterns that were published before 1995. The earliest pattern I have is from 1907. A beautiful blouse, but it is so delicate I think I will leave it in the plastic cover. My goal is to use the fabric I already have. I hope you join too. For more information click on the above link.